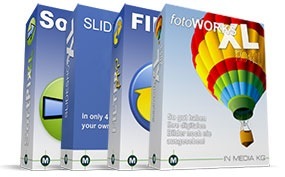 FotoWORKS XL is a very easy-to-use photo editor for anyone. The photo editing software includes many stunning photo effects to edit a photo. With NewsletterDesigner you can create professional HTML Newsletters in your very own design, without any HTML or programming knowledge. Design your Newsletter like professionals do. Easy integration of Pictures, Links and Design Elements. Your Slideshow for PC, DVD, HDTV, Web, Mobile or Handheld! It was never so easy to create professional Slideshows, select a directory with pictures, add your favorite song from a Audio-CD -> finished!